We are constantly striving to improve our levels of service at Angelfish Aquatics. We therefore depend on feed back from our customers, good or bad! Please feel free to let us know how we are doing, whether by phone or by email. We may not be as big as some of our competitors by we do think that we can offer all our customers a very high level of personal service. "'My OASE Aquamax filter UV housing broke and I was struggling to get a replacement. 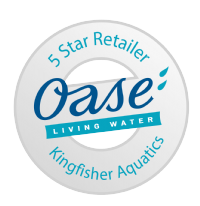 I saw Angelfish Aquatics on the internet was extremely surprised to see a genuine OASE unit at a much cheaper price than competitors. In order to ensure compatibility prior to ordering, I contacted Angelfish Aquatics and spoke to Keith. He spent a good deal of time checking that the item was correct for my needs and physically checked that it was in fact in stock (an issue that has occurred with previous suppliers where I have had to wait for weeks). Upon next day arrival (as promised) I had a problem with the unit in that the UV lamp would not illuminate. I contacted Keith who immediately went through the trouble shooting process, that quickly solved my issue (a safety feature in the unit that I wasn't aware of). Keith expalined that if I wasn't satisfied then he would send a replacement immediately and the original would be collected free of charge. The unit works great and I am a very, very happy customer. If anyone is in doubt about lack of quality, service and value these days, then use this company. I cannot stress enough how impressed I am with both Keith and Angelfish Aquatics." I placed an order with you for a yellow bellied turtle over the weekend and have just recieved delivery of the little guy and I just wanted to say how pleased i am with the quality of service from yourselves. I ordered from your website which was incredibly quick and easy, and thought the information given on each species etc was great. I was also very impressed with the prices of your live stock and also delivery, especially considering how well packaged this tiny turtle was. Overall I am a very happy customer and will definitely be directing other people to your website, and no doubt will be buying from you again myself in the future. Very rarely would I do this, but I just wanted to take the time to write you an email and express how incredibly impressed and grateful I am with the service I have received over the phone with your company the last two days. My partner called yesterday for some information and I made a phone call again this morning to track an order, and each of us both said separately that neither of us have received such brilliant customer service in a very long time! The gentleman that we spoke to was so incredibly friendly and helpful, and I finished the phone call completely satisfied that I was given all the information I needed. "I very recently purchased two fire belly newts from you guys and I thought I'd leave some extremely positive and well deserved feedback! After looking around where to buy newts I discovered Angel fish aquatics, which I'd never heard of before so I thought that I would give them and ring and find out whether they had any fire belly newts. After a friendly chat with someone on the phone about the delivery estimates and what newts they had to offer, I went straight to the checkout and bought one! I was very impressed with the kind and friendly attitude I was greeted with on the phone and by email, you definitely don't get that from most company's. After purchasing my newt I was surprised to see it come next day and before 12pm, which was great because I still had time to go out that day, major credit to excellently picked courier. My female newt came in a well packed and well protected box which had the appropriate labelling and what not, the newt even came in a secure plastic container which contained some beautiful moss which I put straight in my tank! That very same day I purchased another newt and emailed over to ask for a male, the fast response time was incredible and that newt also came with some lovely aquatic plants. Overall I am extremely satisfied with my purchase and these guys deserve more credit than I can give, the only appropriate thing I can think of to pay you guys back is to carry on purchasing from your website, which I will be doing again very soon!! Thanks again to this brilliant company for supplying me with me two new newts :)"
The fish arrived on time and were really well packaged, in fact, they were so well marked as fish and care needed that my delivery chap hoped that they were ok and they were very well, thank you. Six little Sarasa Comets are now happily swimming around in there new home. Many thanks for your very good value, healthy little fish. I dealt with Dan at Angelfish Aquatics. He was extremely courteous and professional and kept me informed at each stage of my order. My delivery of African Dwarf Frogs had to be delayed slightly as the frogs were still in the process of being weened off live food and weren't quite ready to be sent out. I was informed of this immediately and a revised delivery date was confirmed. This demonstrates to me that the welfare of the animals comes before making a profit with Angelfish Aquatics. When my order did arrive, it was packaged extremely well and the frogs appeared very healthy. I will definitely be making Angelfish Aquatics my first choice in the future for anything my aquarium needs. Email and text when they were dispatched including the courier details. Packed very well with room to move, received a call from angelfish the next day to check all was good. Would have no concerns in recommending angelfish aquatics or the courier creature courier to anyone. I purchased my green/wild-type male axolotl from you some weeks ago after looking for a large male for some time and being unable to find one. After finding your site and seeing how you deliver live creatures so securely, I decided to enquire about whether or not you had a large male axie in stock. The email replies were quick and friendly, and I was so happy when I found out that you had what I was looking for! Even more so, my axolotl was delivered safely and in super health, and is an absolute beauty!!! Since then, he has settled in wonderfully with no problems and is getting along almost too well with my other axies. The service I have received has been excellent and I will definitely come to you for any of my aquatic needs in the future. Thank you so much for my gorgeous new axolotl who is such a delight, and for being so friendly and helpful when responding to my questions and emails. Very happy with the purchase. Arrived on time and securely. Axolotl looked very happy. As well as the other fish I bought. The guy I spoke to was very helpful and explained the delivery process. Even the delivery driver was extremely careful in handing over the box. Will be ordering and recommending you. "I placed an order with you online on Sunday morning but ended up having to ring because I'd put the payment details in wrong. The guy I spoke to (soŕry, didn't catch his name) was lovely. Located my order on the system quickly and noticed I was ordering a starter set-up and an axolotl. He very kindly asked if I'd like the tank etc sent early so I could have it ready for my axolotl when he/She arrived. Briĺiant service, meant Steven could move straight into his new home when he arrived on Wednesday and I am beyond happy. He's settled in brilliantly and I'm sure I will only ever use angel fish aquatics for my future needs. Brilliant service, everything was really well packaged and Steven is a very healthy and happy little chap (Or chapess). Best birthday present ever. What amazing service! Ordered a spanish ribbed newt along with a tank on monday and they arrived wednesday morning. Staff were fine with me pestering them with questions and they seem very knowledgeable. Also the newt arrived looking very healthy and the tank also arrived in tip top condition. The newt is now just settling in his new home and i just threw a couple pellets in and he ate em straight away. Definitely will be ordering from here again soon and looking forward to do so.